To update condition notes, select Account Name > Settings from the top right-hand corner of the page, then select Default Condition Notes. If you often sell items that require condition notes, you will want to take advantage of the condition note tools to maximize your efficiency. InventoryLab has two powerful features to help automate the condition note process. 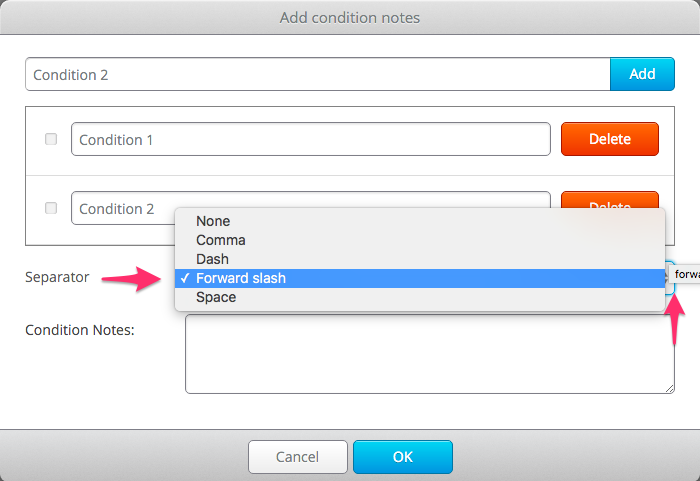 Base condition notes allow you to set up a specific note for default entry on each condition selection you choose. 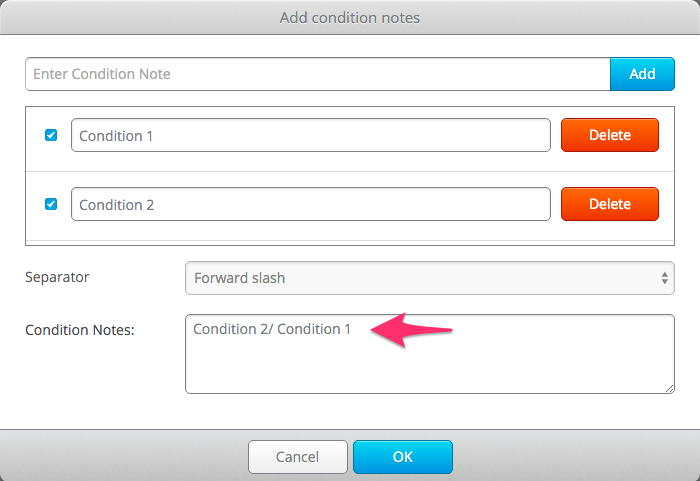 In User Settings>Base Condition Notes there is a Condition selection, with a Base Condition Notes field. If you want the base condition note to default every time you select a certain condition, enter your condition note for the corresponding field. Then check 'Use notes on condition select' and click Save Changes at the bottom of the page. After you save, each time you list an item with that specific condition, the base condition note will automatically populate in the condition note field. If you leave 'Use notes on condition select' unchecked, your base condition note will not auto populate. You will still be able to choose from your common condition notes. Common Condition Notes, or Subnotes, can be setup in either User Settings or List & Prep. Subnotes are generally useful if you have frequently used notes that are not specific to a condition. For example, if you list used books, you may have some books that need a condition note such as “book has torn spine”, while another book may need a condition note stating “pen markings.” These are notes that you would not apply to every item, but can select as needed for quickly adding to the condition notes field in List & Prep. To ADD a sub-note to your list, click on the Common Notes button. Type in your common note and click Add. Repeat for all of the notes you want to include. Choose what type of separator you would like between notes from the drop-down box. To USE your subnotes during a listing, click on the Common Notes button. Click the checkbox next to the subnotes you would like to use, in the order you would like them displayed.